A modular building can be made in almost any shape or size. You can place it in a flexible location and can move it as your business needs change. You should not have to give up functionality in your pursuit of modular office space. 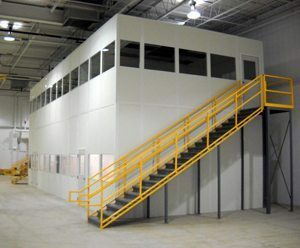 Special modular office rooms and mezzanine space can help you get the unique rooms that you need for your business. A Panel Built in plant office does not have to use a predetermined system for support. Modular spaces are designed to be flexible in placement, so they can stand alone as needed. They are also designed to be fully customizable, so you can get a practical space solution. In fact, a Panel Built modular office can help you take advantage of vertical space with the ability to add additional floors or be placed on an overlooking mezzanine. There are a wealth of options available, allowing you to increase productivity and efficiency. A modular building by Panel Built can be more than a few offices. Few people realize that each space can be made to have multiple purposes. With an extra-strong construction, the modular building can bear heavy loads, making them ideal for storage. The construction can also be adjusted as needed to include large meeting spaces, storage facilities, bathrooms, break rooms or garages. The sky is truly the limit when it comes to modular inplant offices by Panel Built! Learn more about the benefits of these offices and how they can revolutionize the way you do business. Whether you are looking for small modular offices or want to add several unique features to your building, Panel Built is the answer. 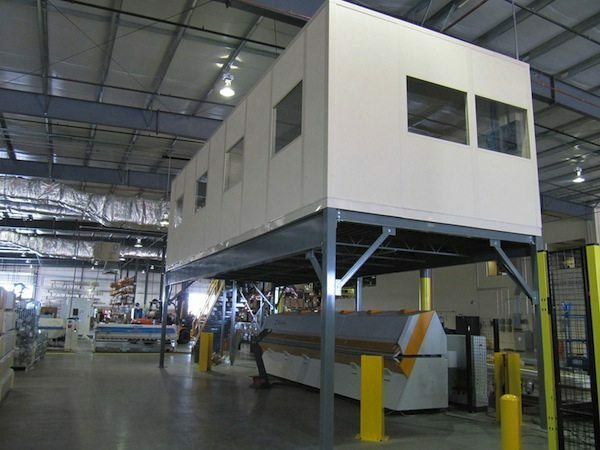 While the company specializes in constructing mezzanines, they are able to focus their efforts on prefab modular office building design as well. The two ideas can be combined as well, allowing you to get a system that truly works for you. No matter how the structure is designed, it can easily be added to later on should your business needs change. Some of the most popular designs simply combine elements of the mezzanine structure with that of a modular building. You will be truly surprised by the designs Panel Built can create for you. When choosing any kind of expansion for your business, it is important to do your research and understand the level of quality you are getting. In Plant Office space is an investment that you will rely on for several years. Panel Built uses only the best materials in construction because the company wants you to be able to rest assured knowing your investment is safe. Strong materials reinforce every inch of the available space, no matter which floor it is placed on. Modular inplant offices are constructed by materials that are selected for their ability to withstand the tests of time and adverse weather conditions. Abrasion-resistant power-coated steel and other durable metals are both affordable and help your modular space lasting for years to come. You also have the freedom to choose different siding or materials as you see fit. There are several options available when it comes to choosing the best modular office buildings for sale. Materials are very flexible, allowing you to have complete control over the design. For example, vinyl-covered gypsum panels can be used in pace of aluminum or steel, helping you to achieve a no-strip look. The material is also very low maintenance and are very aesthetically pleasing. These qualities make the material a favorite in the production industry. Aside from the siding, you will notice that 4-MIL power-coated steel components are used for many of the aspects of the structure. Companies that sell multi-story inplant offices will tell you that these materials are selected for their durability and ability to withstand corrosive applicants. When you first start to wonder where to find inplant offices online, you will need to start looking at companies that are well-known for their experience. Every team member at Panel Built understands the importance of creating quality mezzanines and modular buildings that exceed your expectations. Cheap Panel Built in plant offices available online come pre-assembled and ready to use. Everything is made off-site and then shipped to you, which increases the company’s productivity, eliminates the need for a messy construction crew and helps to cut costs. Their manufacturing facility makes it easy to create some of the best office spaces available. Panel Built has been able to create perfect modular office building for sale for years. That’s why the company stands behind everything that they make with an exclusive warranty. You should feel confident when choosing a modular building. With Panel Built’s dedicated staff members, it is easy to feel proud of your new space. Panel Built is ready to help you get the modular space or mezzanine you need to increase productivity. If you are wondering where to buy prefab modular office buildings, contact Panel Built today. A representative will be happy to provide you with all of the information you need to make an informed decision about your next modular office building.